Adjunct professor Chris Boehm said "We continue to live in a grossly unequal society and perpetuate an increasing wealth gap. It's a world that I don't want to live in. I think as you're seeing here today, many are frustrated with living in it now." Julien Worland said, "The federal government now is subsidizing the wages of all of these people. And it's letting big companies get away with paying salaries that are really unconscionable because they know the tax payer is going to pay the bill." Vernon Cunningham (left) and Danielle Hines said that they can't afford to care for their families making less than 10 dollars an hour. St. Louis protesters joined thousands of others across the nation on Wednesday to push for a $15 minimum wage. Demonstrations occurred at various locations, including a walk-out strike at the McDonald's on South Broadway and a rally at Washington University in St. Louis. Protesters in front of Washington University's Brookings Hall. Hundreds of people gathered on Washington U. 's front steps in the evening to chant mantras like "Show Me 15", "If we don't get it, shut it down", and "This is what Democracy looks like". From fast-food worker demonstrations, St. Louis organizers reached out to other low-wage earners, including retail workers, home health care workers and house cleaners. Adjunct faculty at Washington University and other colleges also participated on Wednesday. After several speakers read poetry and shared their experiences living in poverty and working for Missouri's $7.65 minimum wage, protesters marched from Washington U. to Skinker Boulevard. There, they marched through the street and to the Delmar Loop. Traffic was backed up for blocks; some drivers joined in with the chanting and supported the protesters with honks, fist bumps, and high fives. Some said they came to protest because they themselves can't get by without a $15 minimum wage. Danielle Hines is a member of SEIU Healthcare and works at a nursing home. She said that getting paid less than $10 per hour makes her "play eeney meenie miney moe" with her bills. In Missouri, a full time job paying $10 per hour (usually 2080 hours per year) would pay $20,800, assuming no vacation time or sick leave. According to data collected by MIT in 2012, this amount would be sufficient to care for one adult. Hines, however, does not even make this much. To meet living wage with even one child, Hines would need to make $36,292, more than $16,000 more per year. A raise to $15 per hour would only provide $31,200 before taxes. While Hines is concerned with her own ability to provide for her family, others also worry about the impact of low pay on whether they can do their work well. Hillary Birdsong teaches as an adjunct faculty member in SLU's Spanish department. She explained that with her pay from SLU, she has to work two other part-time jobs. "I hope that [these protests] will get parents to think about what they're spending their money on when they send their kids to school," Birdsong said. "Maybe help us in the fight to get benefits and job security and better pay. Because in the end it affects the student. We can't really give them all the time and the energy that they're paying for." Protesters march down Skinker Boulevard. Just like Hines, Birdsong explained that she knew adjunct professors who had to choose between feeding their kids and paying their utilities. "It's ridiculous that college professors are living like this," she said. Other protesters said that they did not have the same financial urgency, but that they felt a raise in minimum wage was a matter of justice. Emily Crawford, a junior at St. Louis University, said that even though her parents no longer pay for many of her expenses, she came to support others more than lobby for herself. "As someone who's worked a minimum wage job and doesn't have a family to support, I don't necessarily think that it's something that I personally need. But to see my co-workers struggle to put food on the table for their families or cover their rent -- it doesn't seem right," she said. Most protesters said that they were interested in raising awareness for workers' rights, rather than advocating for particular action or change. Student organizer Keaton Wetzel said that he hopes showing the sheer number of low-wage workers unable to live on their pay across many fields will "bring corporations to the bargaining table" and pressure them to make changes. Other protesters explained that they wanted a $15 minimum wage because they are veterans now unable to support their families, because their job can’t cover the cost of their student loans, or because they believe it's a matter of social justice. More than a year before Ferguson Commission member Rasheen Aldridge protested the death of Michael Brown, he protested the low wages he earned at Jimmy John’s. “Looking back, May 8th when we first went out on strike at Jimmy John’s, my first store went out on strike. Then McDonalds on May 9th we shut down the Loop. And it’s so surreal to be doing it again. I would never expect something like this. Not necessarily the numbers but the connection,” Aldridge said before the crowd marched from Washington University to the Delmar Loop. He said two years of organizing for better wages has brought more supporters to the cause in St. Louis. Rasheen Aldridge at the rally. A significant number of demonstrators at Washington University were also regulars at Ferguson-related protests. Aldridge said that’s no accident. Ann Watts, who has advocated to raise the minimum wage since the 1950s, offered a longer-term perspective on these issues. She said that the minimum wage was adequate when she was paid 75 cents per hour, but wages haven't increased as quickly as living expenses. That's what brought her to the demonstration Wednesday, she said. "We want the world to hear us. We want the St. Louis community to hear it, and to know it, and to know that we mean it," Watts said. "We will be asking, and it will change where we shop." 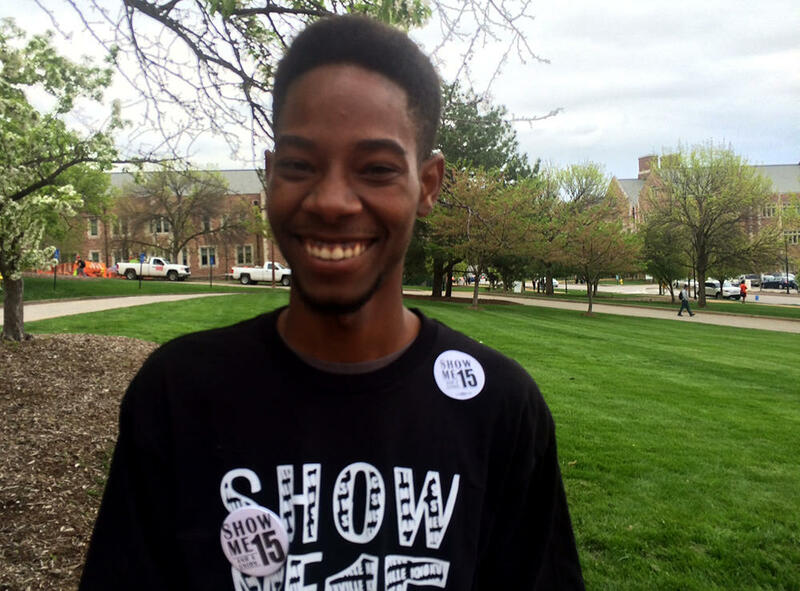 Show Me 15 first organized a protest for higher wages in May 2013, and has been organizing periodic demonstrations ever since.